Eggplants are renowned for their deep purple colors and unique flavor. Eggplants, just like tomatoes, tend to taste much, much better when home grown, rather than when bought from even the best store. Even if store bought produce is grown and picked when flavorful, it frequently travels so far and for so long that when available in the store it is less than appetizing. This is probably never more true than with eggplants, which can be leathery and foul tasting having had to travel long distances. The solution to the flavorless store bought eggplant is to grow them yourself, in your own garden. Growing eggplants can be a great joy, if done correctly. We, however had years of disappointment growing eggplants in our raised beds. It always seemed like something was off, something always conspired to keep the eggplants from producing well. Some years the transplanted seedling would barely grow, other years the larger plants wouldn't set fruit. Finally, even when the plants did set fruit well, like in 2015, the plant was so bogged down that the fruits touched the ground and were soon eaten by ants. First, let's discuss the soil. We strongly recommend composting - in fact we have made a podcast on how to get started composting (listen to all our podcasts here). At the end of every growing season, you should be working your composted humus or organic matter into the soil by hand or with a spade or soil knife. If you include pureed (yes - put them in a second hand blender and press puree) eggshells and decaying plant matter from many different sources, your compost should have all essential nutrients. Listen to our composting podcast to hear what you should and should not put into your compost. As long as you rotate crop locations each year, adding fresh compost really should mostly take care of any nutritional deficiencies the eggplants are likely to have. We have not had nutrient deficiencies causing poor growth, using compost. The next three problems seem somewhat out of a gardener's hands. How do you make sure consistent water is provided to the eggplants, especially in raised beds which dry out quickly? A gardener could of course water their garden every single day (a significant time commitment) but then how do you prevent splitting of the eggplant after heavy rains? Also, how do you keep the eggplants warm on cool nights? Finally, how do you shield eggplants from wind, especially when the seedlings are young and fragile? These three problems - water, warmth, and wind, are all addressable with a single device, the Groasis Waterboxx PlantCocoon, or Waterboxx for short. The Waterboxx is an intelligent plant incubator, inspired by nature, that allows gardeners to grow eggplants (as well as tomatoes and other plants) without continued watering after planting. The Waterboxx, seen below, collects dew, other condensation, and rainwater, stores it in a fifteen liter reservoir, and slowly releases this water to the roots of a growing plant, like a tree, tomato or eggplant. 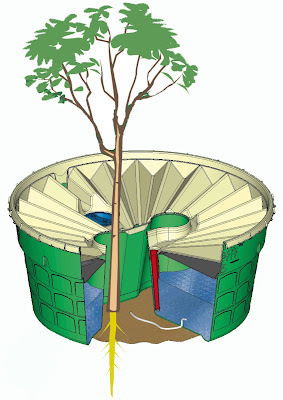 A schematic cross sectional view of the Waterboxx: water is collected on the corrugated tan lid, funneled down siphons shown in red, stored in the green reservoir, and slowly released, by hygroscopic capillary action, into the soil below through a white wick. The Waterboxx releases water through one or two wicks only when the soil is dry, so only when it is needed by the plant's roots. The Waterboxx will almost never run out of water if only one wick is used, and even with two wicks is likely to need watering very rarely. With two wicks and two eggplants per Waterboxx, we have never needed to add water manually - natural sources provide enough. After all, it takes only 4 inches of rain to fill the Waterboxx. When your garden does receive heavy rain, this can flood the soil and cause the eggplants to split. The Waterboxx prevents this by storing most of the water that would be going directly to the plant roots and funneling the rest at least 10 inches away from the plants through an overflow spout. This prevents the roots from getting water logged and prevents the eggplants from splitting, even after heavy rains. What about the need for minimal wind but for consistent warm temperatures? Well - the Waterboxx provides this as well. When eggplant plants are small (less than 20 inches) they are mostly shielded from blowing winds by the Waterboxx. As the plant grows (and grow it will given the consistent moisture from the Waterboxx), the Waterboxx still protects the base the plant stalk and keeps it from blowing over. Water is very good at providing consistent temperatures. This is why some areas along the coast, like San Diego, have mild climates throughout the year almost irrespective of the season. This also applies to the water in the Waterboxx, although on a much smaller scale. The water in the Waterboxx reservoir resists changes in temperature, keeping the plant cool during the day and warm at night. This can be seen below in infrared photos showing how the Waterboxx cools the soil and roots on even a very hot day. 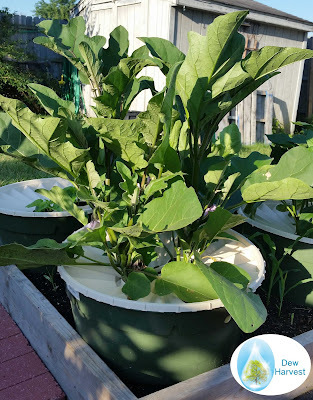 Two eggplants growing in a Waterboxx in a late June in central Indiana. To judge scale, the white lid of the Waterboxx is 10 inches tall, so this plant is almost 40 inches tall currently, and it isn't even close to done growing! 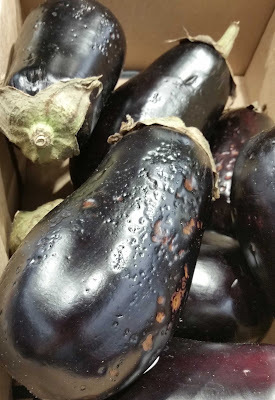 Okay, so even if the Waterboxx has a strong theoretical basis for working and it grows the eggplant plants large, that doesn't mean this leads to more or better looking eggplants. Well, our friend Bill McNeese in Hemet, Southern California was able to keep harvesting beautiful, large eggplants up until December of 2015, as seen below. As you can see, the Waterboxx also keeps the fruit off the soil, preventing premature decay. So, the Waterboxx has both a theoretical basis and proven results for growing large, prolific eggplants. 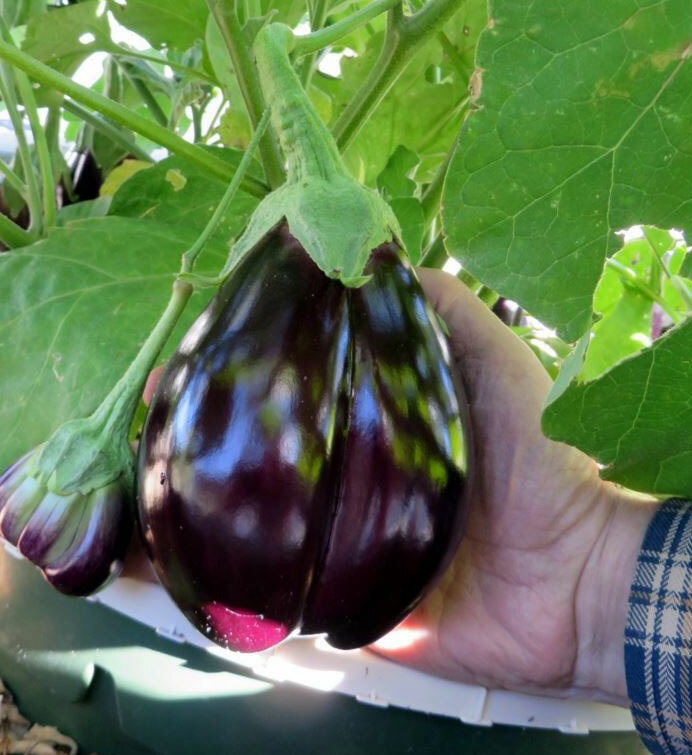 We recommend planting two eggplants per Waterboxx, one in each end of the figure "8" shaped central opening, leading to better pollination and more fruit. When using two eggplants a second wick should be inserted into the Waterboxx, and the water level in the Waterboxx checked every other week. 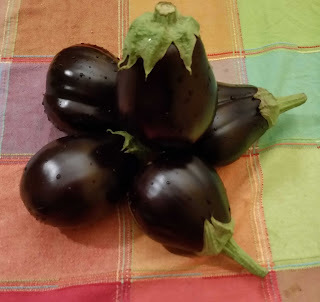 A single day's eggplant harvest - from two plants in one Waterboxx, all with no watering after Waterboxx placement - certainly more appetizing the those available in the store, for a much better price, all told. The Waterboxx can also work for other garden vegetables with a compact central stalk like tomatoes and peppers. You can find out more about the Waterboxx here or buy the Waterboxx here. Please visit our main website, www.dewharvest.com, to see all the Waterboxx's awards as well as a video of how the Waterboxx functions. PK Domain- web hosting in Pakistan has some features which makes us one of the most competitive web hosting in Pakistan like PK domain registration, free domain along with web hosting, cloud data center and web hosting with blazing fast servers. Pay a visit to our website at www.pkdomain.com.pk. We provide resources to support the web hosting in Pakistan along with performance, security, reliability and affordability.